A beach execution. A devastating hurricane. Can Maui's best PI solve the case without his family members becoming the prime suspects? Edgar Allan “Poe” Rutherford is used to weathering difficult cases. And since one of the victims is his sister-in-law’s abusive ex, Poe hopes nobody looks too hard at his own compelling motive… Ignoring the sound advice to keep his nose out, Poe spars with the island’s newest police detective who seems to have her own hidden motivations, especially when she asks Poe to help with another case. Poe has never taken on two murder investigations at once. But as he gets closer to the truth, will he like the answers he finds? 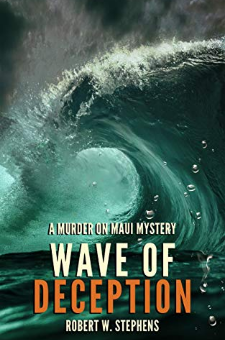 Wave of Deception is a standalone mystery in the exhilarating Murder on Maui series. If you like super-smart sleuths, fast-paced beach reads, and crazy twists and turns, then you’ll love Robert W. Stephens’ gripping trail of clues. Buy Wave of Deception to surf into a double murder mystery today!